A suicide car bomber struck in a predominantly Kurdish city in northeastern Syria on Tuesday, killing seven people, a day after twin car bombings in the same city killed at least 32, including 19 civilians. Also on Tuesday, insurgents shelled five government-held neighborhoods in the northern city of Aleppo, killing 20 people and wounding 100, Syrian state media said. The Islamic State group claimed responsibility for Tuesday's deadly suicide blast in the mostly Kurdish city of Hassakeh, saying it targeted an office of the main Kurdish militia in Syria. Monday's car bombs in Hassakeh were also swiftly claimed by the IS group, which controls large parts of Syria and neighboring Iraq. 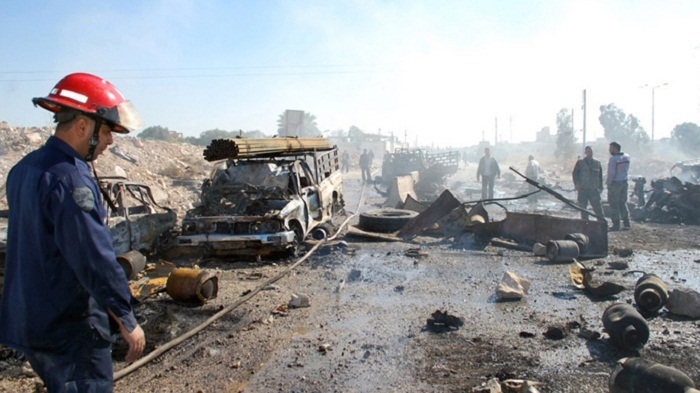 Syria's state news agency SANA said a suicide attacker blew up his truck in front of the water authority building in Hassakeh's northwestern neighborhood of Maaeshiyeh. It said the blast killed seven and wounded 21. The Britain-based Syrian Observatory for Human Rights, which relies on local activists, said the blast killed seven people, including five Kurdish fighters. It said the blast targeted a position of the main Kurdish militia, known as the People's Protection Units, and also wounded 30 people, including some fighters. Syrian Kurdish fighters are largely in control of Hassakeh, which also has pockets held by government forces. IS militants have been battling the Kurdish forces and government troops in the city and surrounding province for months. The Observatory said the shelling in Aleppo, which came amid intense clashes in Syria's largest city and onetime commercial center, killed 21 people, including seven children, and wounded 70, adding that the death toll is expected to rise since some were seriously wounded. Discrepancies in accounts of casualties are common in the immediate aftermath of large attacks. Aleppo has been divided since 2012, with government forces controlling much of western Aleppo and rebel groups in control of the east. The conflict in Syria has killed more than 250,000 people since it began in March 2011, according to U.N. figures. Damascus: A car bomb exploded Tuesday in the northeastern Syrian city of Hassakeh, killing seven people, a day after two blasts in the predominantly Kurdish city killed dozens, state media and an activist group said. There was no immediate claim of responsibility for Tuesday’s blast. Monday’s car bombs that killed 32, including 19 civilians, were swiftly claimed by Daesh. Syria’s state news agency SANA said Tuesday’s attack was carried out by a suicide attacker who blew up his truck in front of the water authority building in the northwestern neighborhood of Maaeshiyeh. It said the blast killed seven and wounded 21. The Britain-based Syrian Observatory for Human Rights, which relies on local activists, said the blast killed four, including two Kurdish fighters. It said the blast targeted a position of the main Kurdish Force known as the People’s Protection Units, wounding 30, including some fighters. Syrian Kurdish fighters are largely in control of Hassakeh, which also has pockets held by government forces. Daesh terrorists have been battling the Kurdish forces and government troops in the city and surrounding province for months. Earlier Tuesday, insurgents shelled government-held neighborhoods in the northern city of Aleppo, killing seven and wounding 52, state TV said. It says mortar rounds rained down on five Aleppo neighborhoods. The Observatory said the shelling, which came amid intense clashes in Syria’s largest city and onetime commercial center, killed seven and wounded about 50, adding that the death toll is expected to rise since some were seriously wounded.